IT was a dog of a weekend for Foreign Minister Alexander Downer with relations between Australia and Indonesia almost hitting another low. It all started when Australia granted temporary asylum to 42 West Papuans who claimed they were being mistreated by Indonesian authorities. 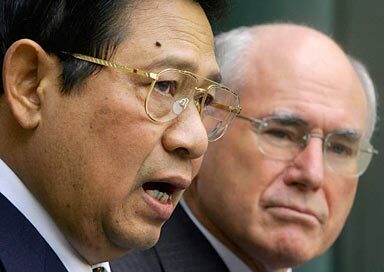 Indonesia recalled its Australian ambassador. From there, things just kept getting worse. My Canberra sources advise the Indonesian ambassador was exceptionally miffed by the recall. He'd already spent $50 on his ticket to attend the fundraiser for the Canberra Islamic Centre that weekend. Muslim comic Amro Ali was the star act at the dinner, taking the "puss" (to use less offensive Kiwi pronunciation) out of Muslim reactions to all things Danish – including some advice for Danish companies suffering from Arab boycotts. With demand skyrocketing across the Middle East, Amro suggested the Danes switch from exporting ice cream and pastries to Danish flags. The present dispute between Australia and Indonesia has now escalated into a cartoon war whose recurrent themes make Australian tourism advertisements look a "bloody-hell" lot less crass. An Indonesian tabloid, Rakyat Merdeka ("People's Freedom"), published a cartoon showing a dingo with a head resembling Prime Minister John Howard engaged in a morally compromised position with another dingo resembling Downer. The caption has the dominant prime ministerial dingo saying to his mate: "I want Papua!! Alex! Try to make it happen!" The heading was "The adventure of two dingo (sic)". The PM-dingo reference to Papua was in the context of claims by Indonesian nationalists that Australia was plotting independence for the province of Papua. The newspaper is famous for offending Indonesian politicians and breaking corruption scandals. Its editors seem to spend more money defending defamation suits than on news gathering. One of many newspapers competing for a readership hungry to take advantage of the liberalised political and media environment. Rakyat is apparently an Islamic-leaning paper. This humble writer fails to find the Islam in such a cartoon. Some years back, I was handed a copy of the MMG ("Muslim Marriage Guide") to read in place of holding a bucks night. The MMG sadly didn't illustrate any theologically appropriate matrimonial positions. But it did warn of severe divine retribution resulting from . . . um, perhaps I'll use Freddy Mercury's phrase of "riding one's bicycle". So when Bill Leak from The Australian decided to respond to the Indonesian paper, he probably said to himself: "Bugger it! I'm going to give those Indonesians some nasty goreng!" Leak drew a cartoon of an Indonesian – said to be generic but resembling President Susilo Bambang Yudhoyono – as a dominant dingo mounting a Papuan dingo with a bone in his nose. The Indonesian addresses his mate with the following endearment: "Don't take this the wrong way" and the caption reads: "No Offence Intended". Downer immediately went into damage control, telling reporters his Government "does not condone in any way" the cartoon and "disassociated" itself from it. "From a personal perspective, I find the cartoon tasteless and offensive and see no merit of any kind in its publication," Downer said. So once again cartoons are dominating headlines in Indonesia and Australia. However, on this occasion, the Muslims are having a good laugh. It was reported the president of the world's largest Muslim country laughed when told of the cartoon. Only God knows what the dingoes are thinking.